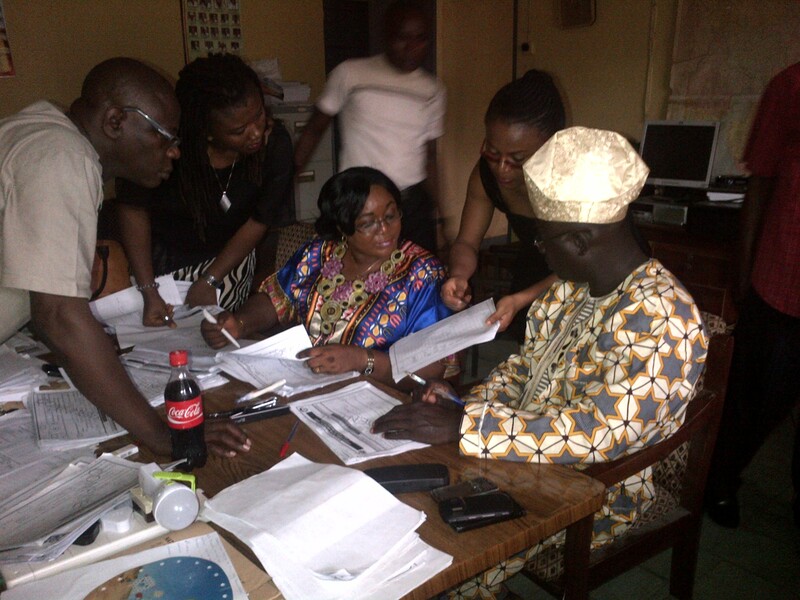 Spaces for Change’s independent observers monitored the 5-day national job creation survey exercise conducted by the National Bureau of Statistics between July 7-11, 2014 in Lagos State. Since it began in March 2014, our association with the National Bureau of Statistics has been a tremendous asset to our social and economic data monitoring undertakings. Through this collaboration, we are piloting a new approach to civil society-government engagement. Our thanks go to the Statistician General of the Federation (SGF), Dr. Yemi Kale and Mr. Emesiri Ojo, Technical Adviser to the SGF, for engaging Spaces for Change to independently observe the survey exercise; Mr. Adegbie Ademola, Head (Business Enterprises Statistics Division) and Mr. S. A Phillips, Lagos State Coordinator for providing extensive assistance with data inspection; facilitating field visits and interviews with federal and state statisticians, field officers, public and private corporations in Lagos State and giving us unfettered access to independently review official documents, questionnaires and policy frameworks. We are also grateful to so many state supervisors, editors, field enumerators and monitors for their invaluable cooperation and support throughout the exercise. The method used involved in monitoring the job creation survey exercise include web-based desk research on employment generation trends witnessed in the preceding job creation surveys; two planning and coordination meetings between National Bureau of Statistics and Spaces for Change held on May 27, 2014 and July 3, 2014 respectively; extended email discussion around the survey questionnaire templates; telephone and one-on-one interviews with federal and state enumerators and officials of the NBS; field visits to public and private corporations in Lagos State. Particularly visited were public institutions and organisations reported to have a history of non-response to survey questionnaires. During the survey exercise, Spaces for Change monitors reviewed policy instruments and skim-checked the collated questionnaires, including correspondences exchanged with surveyed institutions in the public and private sector. There were regular focus groups involving small gatherings of officials ranging between five and ten to discuss and evaluate different aspects of the survey methods and processes. In this regard, Spaces for Change team of monitors met with NBS state officers, two representatives from the Presidency, Abuja and a number of the supervisors overseeing the officers assigned to distribute the questionnaires. Each supervisor was assigned two LGAs. There are 20 recognized LGAs in Lagos, and 37 local development councils. Data collated are categorized into formal and public sector jobs. All other jobs outside this category are referred to as informal jobs. Formal jobs refer to employment generated in establishments that employ 10 persons and above, or formal professional services that employ less than 10 persons. Informal sector jobs are those generated by individuals or household businesses employing less that 10 or those businesses operating with little or no structures e.g. those in agriculture and wholesale and retail trade. Public sector jobs are those created by and within the public institutions such as the government ministries, departments, Agencies (MDAs), government parastatals, academic and research institutions at federal, state and local government levels. It is our hope that the independent report of findings we presented and discussed extensively with the NBS authorities on July 15th and July 23rd 2014 will be useful to official efforts to improve quality and transparency in the data gathering processes, and spur the reform of institutional arrangements guiding data collection and policy formulation on job creation.